… living out in the French sticks with 2 small children while trying (unsuccessfully) to work out what to do next. This was waiting for me in the bathroom this morning. I live a life of danger wherever I tread. I then trod on a Kwazi Octonaut which was very painful as he had a shark on a lead. When we first moved to the Ardèche and were working on the house we discovered a ton of scorpions. We were doing a lot of dusty demolition work which mainly involved L’Homme banging at unwanted walls and me lugging the fallen stones and rocks back and forth in a wheelbarrow. Every now and again I also had a go at banging at the odd chimneyplace but it isn’t as much fun as it looks and my meagre muscles meant a lot of banging with not much rock-falling. So I went back to wheelbarrowing and sorting the stones. 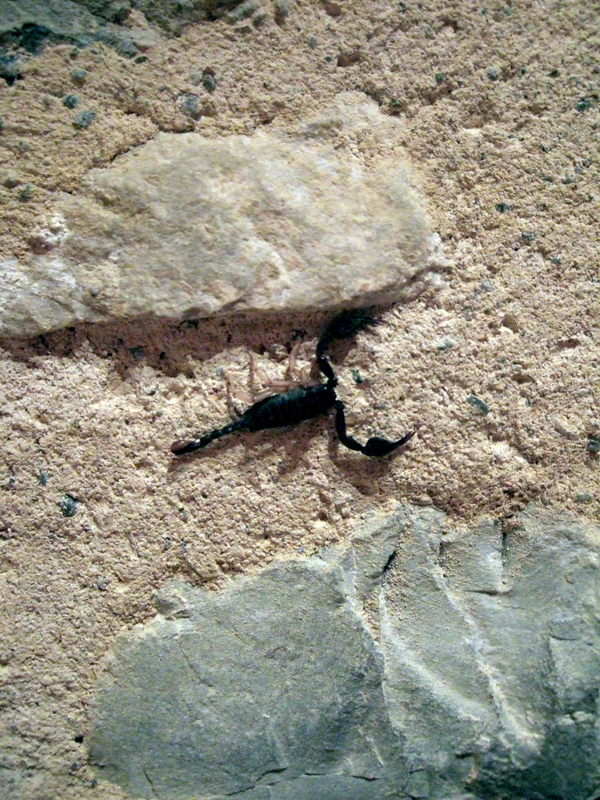 And lo, I discovered many a scorpion. My first scorpion had me screaming and running in the opposite direction. I just assumed they were poisonous and that with one fell flick of that tail in my direction, I’d be a goner. It felt like coming across a boa constrictor, or a tarantula. Scorpions were part of that terrible group of crawling, slithering animals that don’t say much but kill ruthlessly. I didn’t even try to get rid of the scorpions as they looked to me like they would raise themselves up on their pointy claws, do a recoiled spring style backflip onto my face and plant their stinging thing in my eye. So I just ran and got L’Homme to come and scare them away. L’Homme wearing a builder’s face mask and just having ingested a kilo of dust is frightening enough to scare anything away. 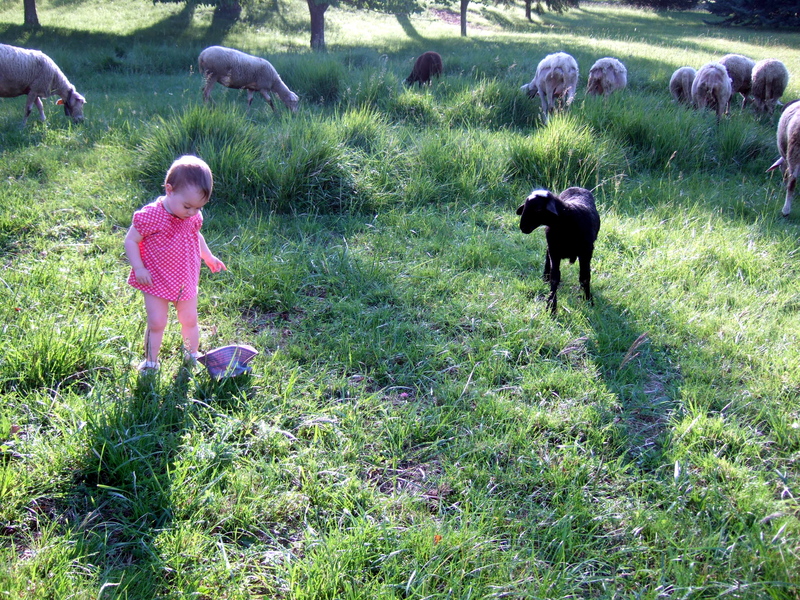 He would try to crush them with his steel toe-capped workman’s boot but they just stubbornly wriggled away. “There’s no point” I told him knowingly, “Scorpions are invincible. Nothing can kill them. Not even a nuclear bomb. After Hiroshima the only things that survived were cockroaches and scorpions.” And then L’Homme killed one. Squashed it to bits. Blimey. Is L’Homme really more destructive than an atomic explosion? This was a bit worrying so I looked into the matter and discovered that insects, being small and armoured, can withstand much worse explosions than humans and are more resistant to radiation. Especially cockroaches. Dunno where I got the scorpions from then. I also discovered that French scorpion bites are no worse than a wasp sting. Ah-ha! I felt empowered. No longer would I run screaming from a scorpion. At least, I like to believe that’s how it works. This entry was posted in Ardèche & Gras, L'Homme by inagainoutagain. Bookmark the permalink. 07/07/2012 - Bye bye for now.